This is my concluding review of Ehrman’s How Jesus Became God, giving a summary of the book and my overall impressions. For a slower in-depth walk through the book, its arguments, and the reply book How God Became Jesus, check out my series Ehrman’s Christology War. Whenever Bart Ehrman releases a book it is an event. I’m sure one reason is his controversial and eyebrow-raising topics. The wary amongst us no doubt see him as an apostle of the skeptical and not unappreciative of the profits that come with the role. I’m sure his standard release dates doesn’t hurt either – right before Easter! However, we mustn’t also forget that Ehrman is a master communicator. He is not only an accomplished scholar (particularly in the realm of textual criticism), but he has the talent for making the difficult understandable to a wider audience. Bring together all these factors, then ratchet them up a notch and you have How Jesus Became God, an account of how the beliefs regarding the person of Jesus developed throughout history. In other words, “[h]ow did Jesus become God?” (p1). Ehrman’s approach is straight-forward. He begins with a wide-angle view at the Greco-Roman and Jewish backgrounds and concepts that he believes provide a foundation for early Christian’s conception(s) of Jesus as “divine”. Many today are guilty of an anachronistic reading of the Bible, where we read the text with our own concepts and categories, missing the original context. 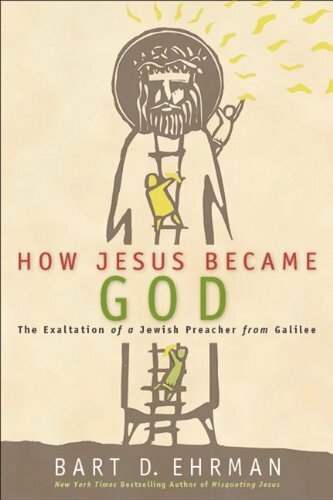 In contrast to the modern mind that often conceives of an unbridgeable gap between man and g/God, Ehrman contends that not only did pagans “[imagine] that humans could be divine in some sense” (p83), but perhaps surprisingly, “the same [was] true within Judaism” (p83). They held to a gradation of divinity, with different kinds and levels of divinity. So when we approach the question of whether Jesus is divine, we need to ask “in what sense” (p84) or rather, in what senses; a point that Ehrman emphasizes throughout. 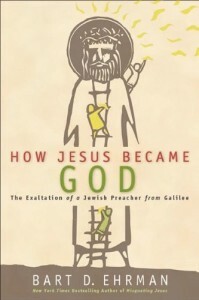 Having restored the conceptual world of the ancients, Ehrman now places Jesus within it and sees how He fits. Ehrman takes a very pessimistic view on the Gospel’s reliability, and when he applies historical methods for identifying the realities behind the text we find a different Jesus than we are used to. Instead, we have a man who, stripped of the later theologizing reflected in the Gospels, saw Himself as an apocalyptic prophet-Messiah awaiting the in breaking of God’s kingdom. Jesus’ message was certainly not, “Hi, I’m God”. in Ehrman’s words, “Jesus did not declare himself to be God” (p128). So when and how did Jesus’s followers think of Him as God/divine? It was through a belief in the resurrection that the man Jesus was then “elevated to a divine position” (p210). From here, Ehrman begins to walk forwards in history where belief about Christ’s divinity was meanwhile being backdated, with “increasingly exalted things” (p212) being said about Him as time goes on. For example, the beliefs of the earliest Christians (early Christology) saw Him as a man-made-divine upon His resurrection, but that quickly developed to seeing His exaltation taking place at His baptism (in the Gospel of Mark), and then backdated further to His very conception (in Luke and Matthew). It is not surprising, then, as Jesus’ “divinity” was being pushed backwards in His life, that soon enough it would start tipping over into ideas of preexistence. Development is even seen here, with Paul portraying Jesus as an angel exalted to equality with God after His obedience, while John and Hebrews show Him as equal with God before His earthly existence. Moving past the New Testament writings, Ehrman then traces the development of Christology through the early Christian centuries to the council of Nicea, and beyond. Different strands of Christology start to merge into one as greater clarity is reached, or, according to Ehrman, alternative views were most often just stamped out by applying the “heretical” label. While early Christians held a multiplicity of views on Jesus, “one perspective from early Christianity emerged as triumphant” (p287). As “orthodoxy” became more clarified, other viewpoints became frowned upon (or worse). This leads to Ehrman’s conclusion, which implies that this battle over Christology even leads to antisemitism, as “the Jews killed their own God” (p361). Readers of my chapter summaries will know I was fairly critical on Ehrman’s argumentation and will be expecting some kind of blunt instrument to make an appearance at this point, but I would like to begin with points of appreciation. I must say that as a teacher, I am very jealous of Ehrman’s clarity and pedagogical skills. I have no doubt that he is an engaging teacher; he manages to remain readable even in the most complicated of subjects. Ehrman is not only clear, but is ambitious; he is attempting to cover a substantial amount of ground in a relatively short book without steamrolling over the complexities of the topic! As to the content itself, he makes a number of good points and rightly highlights that Christology did not fall fully-formed from the heavens. I was also glad that Ehrman took a “high” view of Jesus in much of the NT, such as Phil 2:9-11, John 1:1-3 – rightly rejecting the more liberal exegeses. With this said, my disagreements with Ehrman are substantial. Most fundamentally, I believe Ehrman’s methodology and presuppositions lead to his skewed conclusions. His approach is much like a ship setting sail a few degrees off course: as time goes on the discrepancy becomes more and more apparent until the ship is utterly lost. A number of his insufficiently-substantiated presuppositions completely colour his arguments, and if the reader doesn’t share these presuppositions then they will be left behind as Ehrman rides off into the distance, dropping entire Gospel pericopes like dead-weights along the way. The details of my disagreements can be found in my blog series, but risking vagueness, I just didn’t find his arguments compelling. His arguments on Paul’s angel Christology are weak and half-baked. Ehrman even admitted that he reached this view only a few months before publication. It is skeptical beyond reason to simply assume with Ehrman that the early Christians “made up” perhaps the majority of the Gospel stories. Too much NT data was treated like an unfortunate petal in a game of “she loves me, she loves me not”: he has Biblical authors disagreeing with themselves in their own writings, draws an artificial wedge between texts by applying his “adoption” and “incarnation” labels to them, and reads other texts in odd ways to fit his own conclusions. While this is a popular level book, it is a shame that Ehrman doesn’t give more space to “disproving” his opponents, since many Christians (or those with a Christian foundation) will read this book and be surprised when Ehrman doesn’t consider or even mention a traditional Christian view of a given text. Neither does he engage thoroughly with scholars who are of a different persuasion then him, most notably Richard Bauckham. An account of Christology needs to make sense of all the texts and rebut the best of alternate views, something Ehrman certainly doesn’t do here. Also, Ehrman’s rhetoric runs away from him at times and at times he resorts to little more than snap shots at Christians. When he does engage with evangelical scholarship, it is often only to dismiss or portray in a negative light. Apologists face the worst of Ehrman’s rhetoric, and are cast in a purely negative and ignorant light. On the flip side, “scholars” and particularly “critical scholars” are apparently all on Ehrman’s side and are implied as beyond criticism by virtue of their “scholarly” status. Ehrman presents “scholars” (who all agree with him) as the only ones in the loop, with Christians and apologists either ignorant or deceptive. Instead, what matters is the arguments, not who is making them; in reality, sentences beginning with “scholars say” actually mean very little as it is possible to find scholars who agree with virtually any conclusion. For anyone interested in Christology, How Jesus Became God may be good reading. Ehrman is fun to read, he introduces the issues clearly, gets the reader thinking, gets many points right, but misses the mark through his often weak argumentation and faulty conclusions. It is for this reason that I would hesitate to recommend it widely. My final question is what is Ehrman trying to achieve? I hope I don’t spoil the ending for anyone here, but How Jesus Became God concludes on such a surprisingly abrupt note that I will quote the last paragraph in full, “This God Christ may not have been the historical Jesus. But he was the Christ of orthodox Christian doctrine, the object of faith and veneration over the centuries. And he is still the God revered and worshiped by Christians throughout our world today” (p371). That’s it! So I am left asking why write this book? What is Ehrman’s purpose, since his work is too heavy on rhetoric and his views too idiosyncratic to offer a purely detached and objective historical account of Christology? What does he want the reader to know or think? That the Christ of faith is not the Christ of history? If so, I’m afraid that he has failed to convince me. But if one doesn’t have ears to hear then strong rhetoric mixed with thin argumentation may unfortunately suffice.